StarWars.com just announced that the upcoming 26th issue of Marvel's ongoing Star Wars series (set between A New Hope and The Empire Strikes Back) will be a flashback issue, featuring a pre-The Phantom Menace Yoda adventure! The series has previously done flashbacks to Obi-Wan's time on Tatooine between Revenge of the Sith and A New Hope. To justify the flashbacks the series has features Luke Skywalker reading from The Journal of Obi-Wan Kenobi. "Star Wars #26" will do the same but with a twist: Luke will read the story "without knowing who Yoda is or that it’s actually about him". 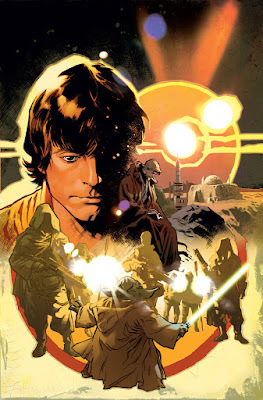 The series is written by Jason Aaron and the issue will feature art by Salvador Larroca, who previously worked on the Star Wars: Darth Vader series. "Well, you know, we’ve been doing different issues between the arcs, focusing on Obi-Wan. I’ve really liked doing those. They’ve gotten a nice response from fans, people seem like they’ve really enjoyed those. So we’ve liked jumping around to different parts of the timeline like that, and [telling] a story that would connect tangentially, or just in terms of the overall theme but not necessarily vital to our ongoing plot. I kind of wanted to do something like that, but instead of having it be just a standalone issue between the arcs, have it be the actual arc. And of course, I was always trying to figure out a way for us to use Yoda. We’re a bit hamstrung in terms of the time period of our main story, because Yoda’s chilling on Dagobah. So this was kind of the only way we could kill all those birds with one stone — to do one story that connects Luke, Yoda, and Obi-Wan all at the same time, while still taking place in three different time periods." "I don’t know if we’ve put a pin in exactly when it takes place. It does take place before Phantom Menace. We do get a brief appearance by Qui-Gon and young Obi-Wan, so that’ll probably help date it." Marvel's "Star Wars #26" hits shelves this December!